You can never start early enough creating Halloween decorations. 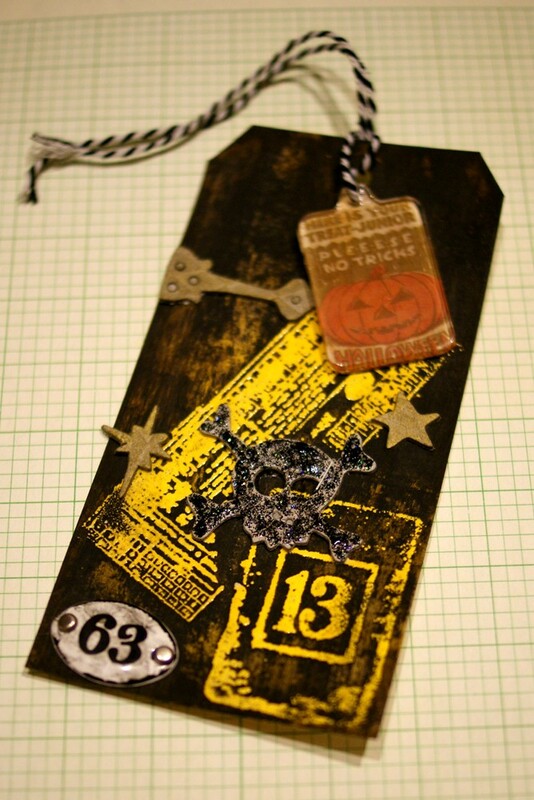 Today Aki from our DT will show us a fantastic Halloween Tag tutorial. 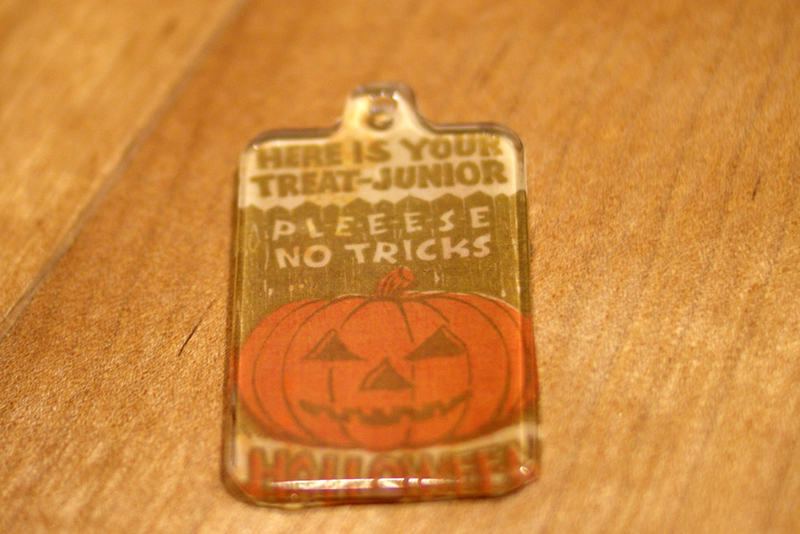 Here is a Halloween tag, with some inking techniques. 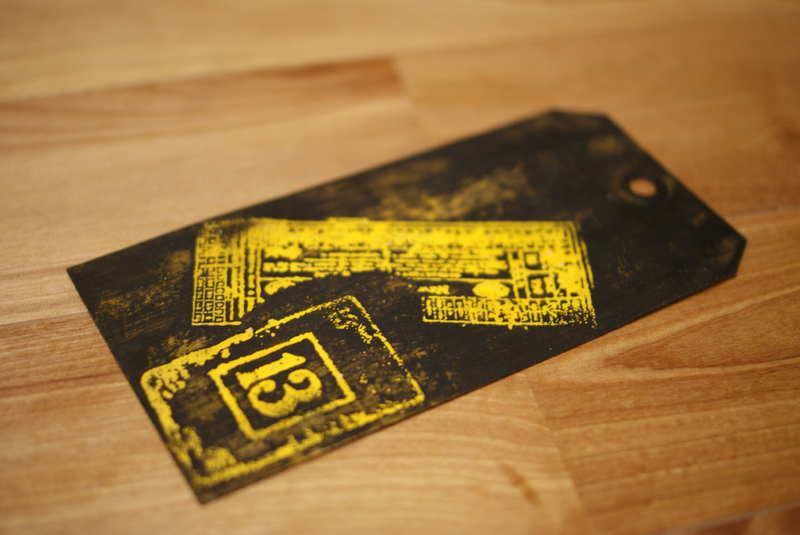 I used many Tim Holtz products but this tag is not so much Tim Holtz-like. 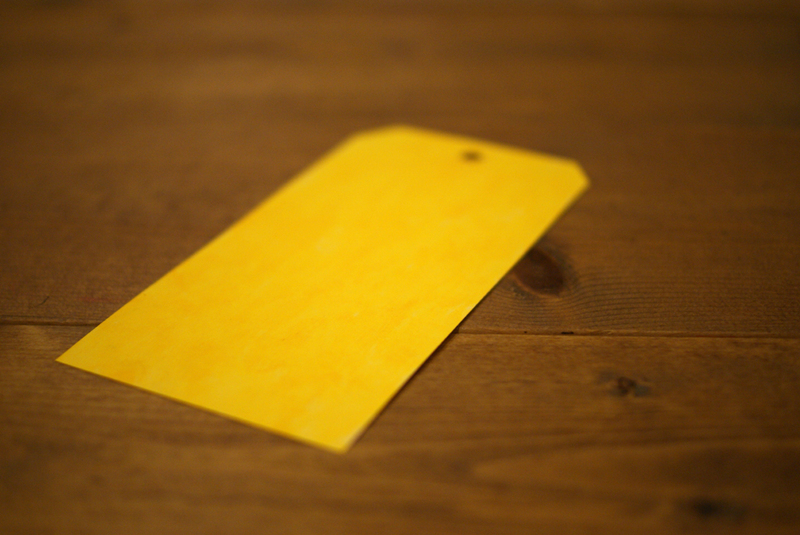 Paint the tag with orange acrylic paint. Stamp with embossing ink, and then cover images with clear embossing powder. Heat until powder melts, and let cool. 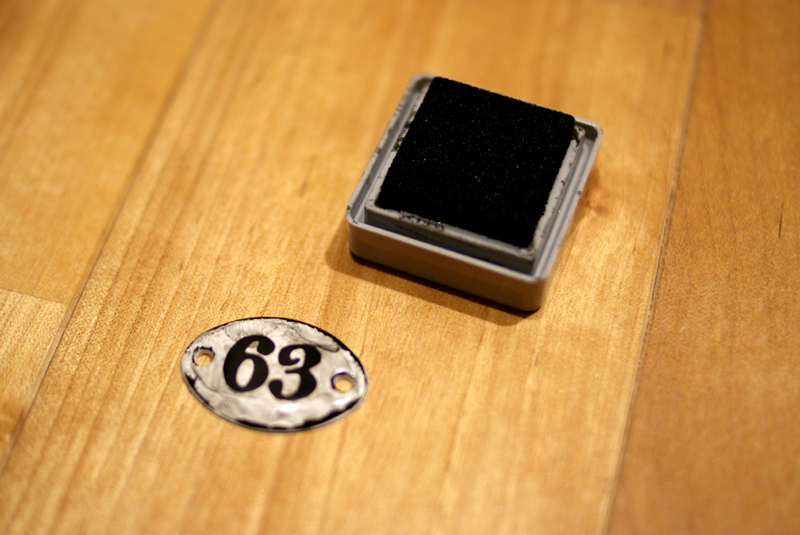 Paint over the tag with black acrylic paint. 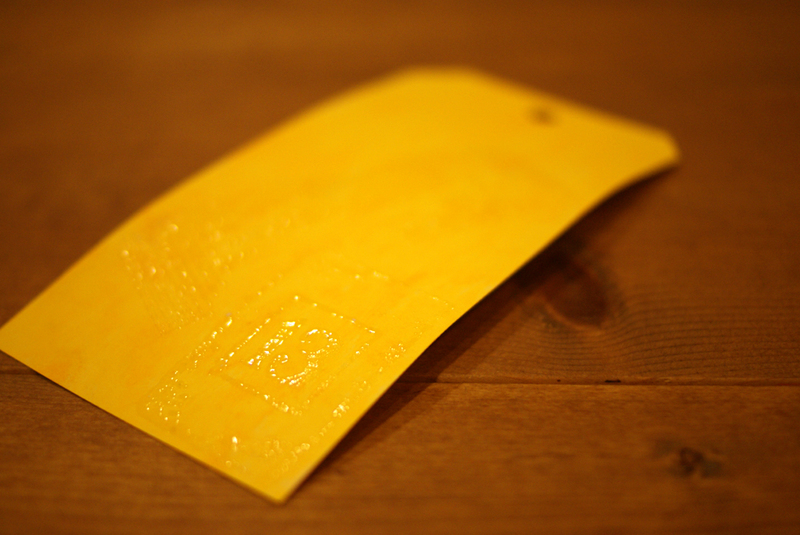 Wipe the tag with wet cloth. Distress the metal plaque with black ink. Cover grunge board piece with black stickles. Apply adhesive to one side of fragment and place it on a cut-out patterned paper. Embellish the tag with grunge board and tie the fragment with baker’s twine. Now it’s done! So? Isn’t it great? Let us know what type of decorations are you planning for Halloween this year. I recently came across this product and thought it sounded too good to be true. However a very forgiving price made me buy a pack to try out. At £14.95 they were about €18. This was a very decent price for a pack of 24 colours! The box they come in is very clever and a handy way to store them. 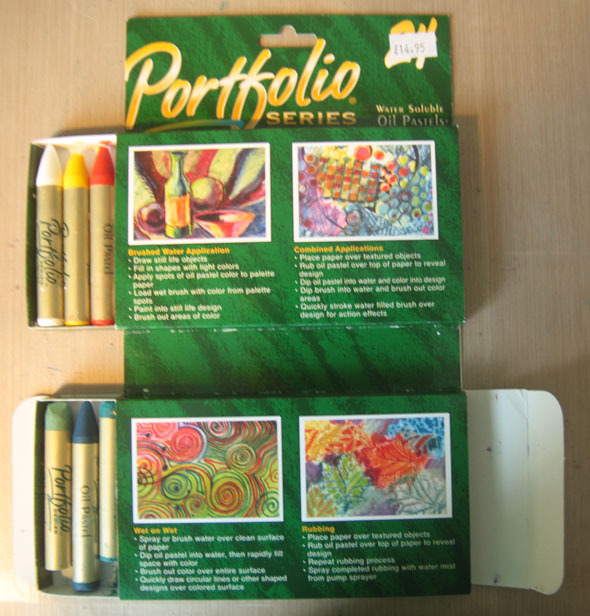 I used to use oil pastels a lot back in my traditional art days. I love how smooth they are to draw and colour with and love the texture. However I hate the mess they can leave. Oil pastels are obviously oil based. The oil in them never completely dries so anything done with oils can be difficult to fix and preserve. So what makes these pastels so special? 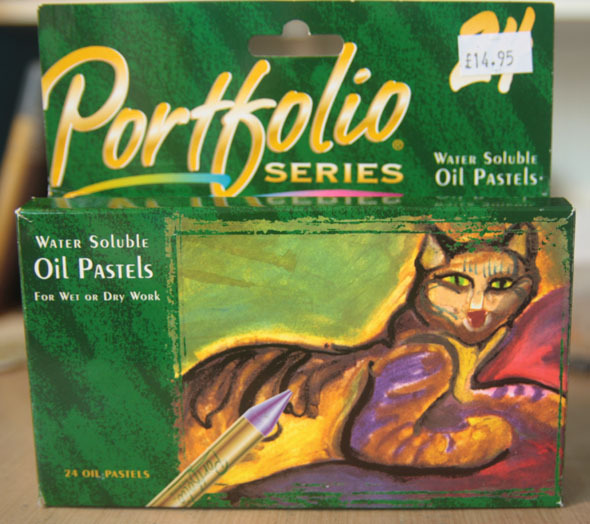 Well these pastels can be used as traditional pastels. Or you can use water to blend or wash the colour out. If you combine this with a fantastic range of colours that comes in the pack you have a very fun and versatile product. To see how easy and versatile they are to work with check out page 16 of Issue 9! Below are some of the samples of what you can do with them…. It’s the second last day of the 12 Tags of Christmas! Tims Day 11 tag can be found here. I loved the technique that Tim used on his tag today. The method of shrinking the plastic in the UTEE while coating it was fantastic. However I simply didn’t have the time today to do this. I have no large Christmas stamps so I stamped a sentiment and cut it out and inked it. I created a background similar to Tim’s and then came my big cheat! I took a trip over to the Graphics Fairy and downloaded a image of some holly and berries and a fantastic Victorian (and blue) Santa! I printed these both out and added to my tag. I put a layer of glossy accents on the holly to get a glassy look like on Tim’s tag. This little cheat made my tag quick and easy to make. I am looking forward to having some free time to try out the fantastic technique though!! 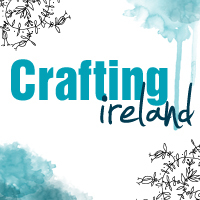 For supplies check out Create With Kate!! 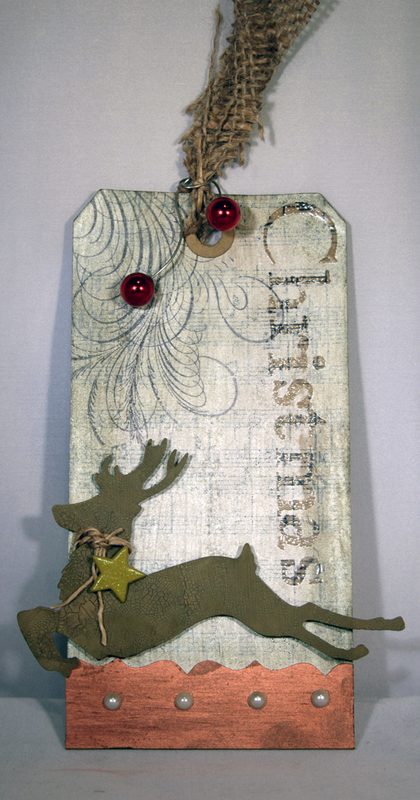 Hi all, it’s Day 3 of Tim Holtz’s 12 tags of Christmas and we love the techniques again he just shared with us. Tim’s tag can be found here. I had no large text Christmas stamps so I made a collage of Christmas stamps and inked them all up different colours. 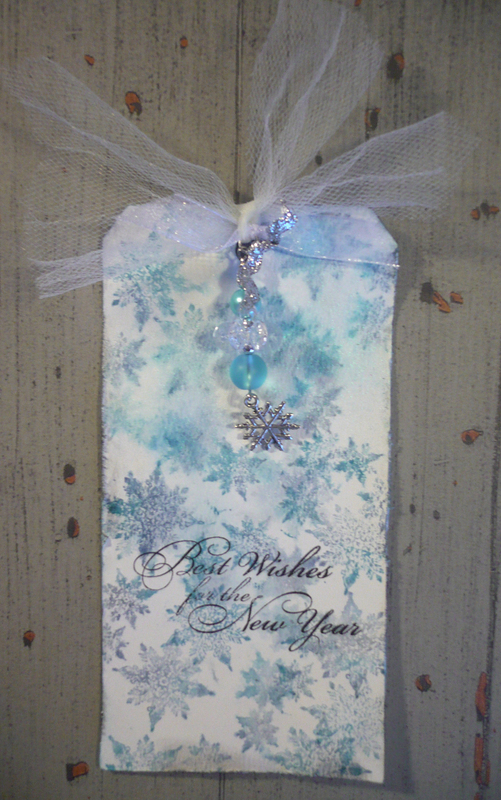 I embossed the bottom of the tag with an inked embossing folder to give the effect of colour in behind the snowflakes. I added some leaves and a flourish. I made berries from card candy and coloured them red. 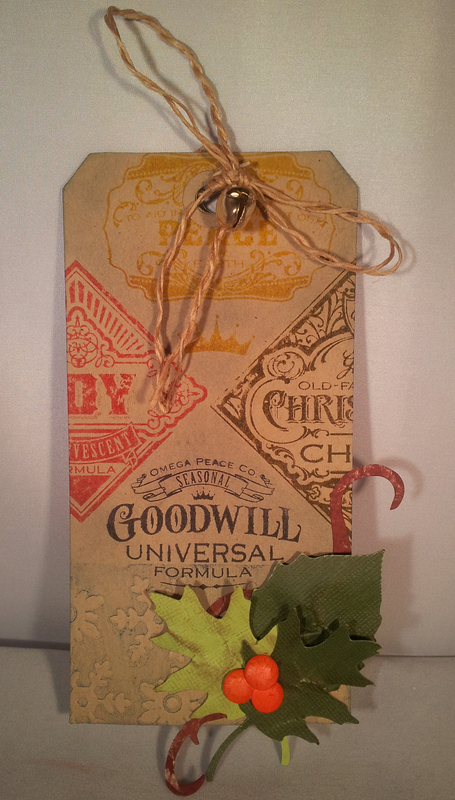 I then used twine and a bell for the top of the tag. It is very different from Tims tag but different is fun right?! I really liked Tim’s bonus project, so I decided to create a tag along that line. This watercolour effect looks great and so easy to achieve. I haven’t got many of the reinkers, so I just simply inked the snowflake stamp with different colours starting with the lightest. I also sprayed the tag with a little perfect pearls mist. I added some charms and white tulle. I hope you are enjoying this crafting journey as we are. craft sheet, cut n’ dry felt, distress reinkers (or any waterbased reinkers), distress ink , archival ink pad/jet black, glossy accents, cosmic shimmer mist gold, ink blending tool, alcohol ink/red pepper, ink applicator tool, festive greenery die, christmas background & border texture fades;, scissors; twine, bell, bling. 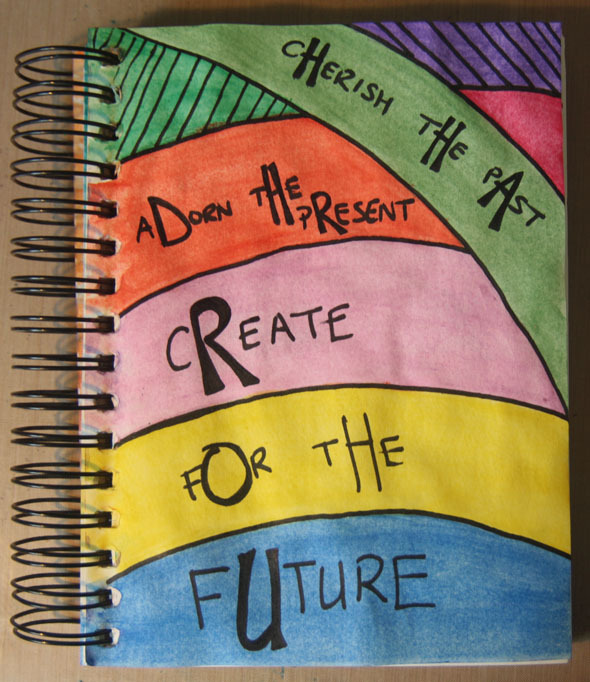 It’s Day 2 and another day of inspiration from Tim Holtz. His day 2 tag can be found here. For me it was another day of improvising to work with what I had. I had no kraft resist paper so I made some. I stamped music notes on a kraft tag and then clear embossed the word Christmas ( I used alpha stamps to do this as I had no large Christmas sentiments!). I had no distress stain, picket fence or otherwise. 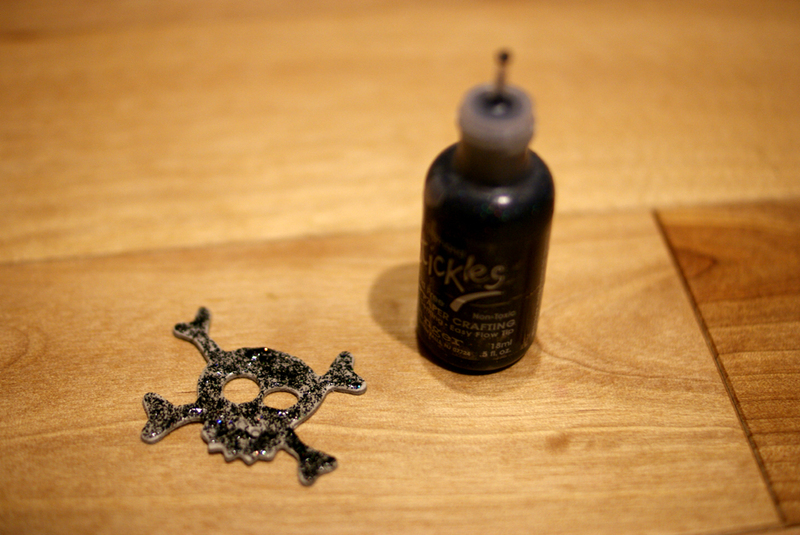 So to improvise a wash over my tag I put a small bit of the paint from a Pearl paint dabber on a craft mat. I spritzed with a lot of water and mixed it well. I then painted this over my tag and when dry wiped it off my clear embossed sentiment. I used a on the edge die to cut my bottom strip for the tag and inked it up copper and distressed it up a bit. I added half pearls instead of brads like Tim did as I didn’t have enough brads. I stamped a flourish on the top left of the tag. 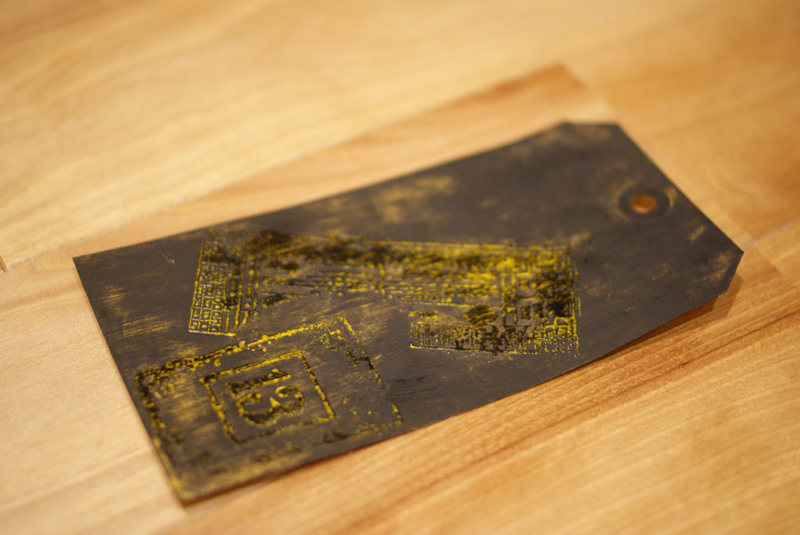 I inked my tag with some forest moss ink for a bit of distressing. I cut the reindeer out using my eCraft and painted it with crackle paint. I gave him a little twine collar with a star hanging off it. 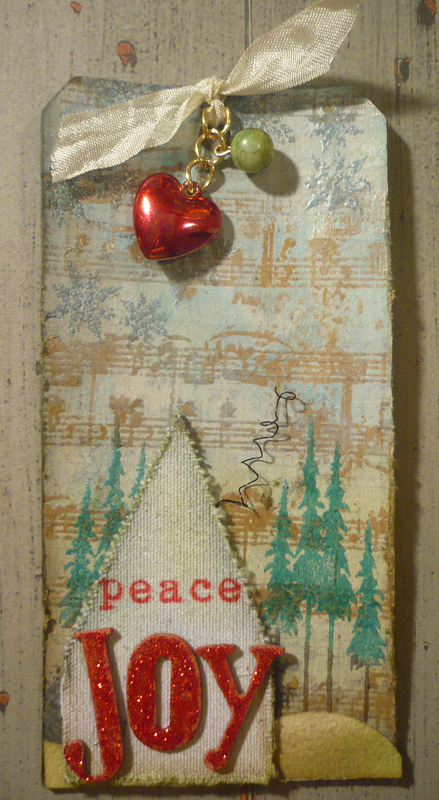 I used burlap for my tag top and some red baubles for a pop of colour. Like Nicole I haven’t got many of the supplies, but I used what I had and had fun creating. I used kraft resist paper from the original kraft resist pad. 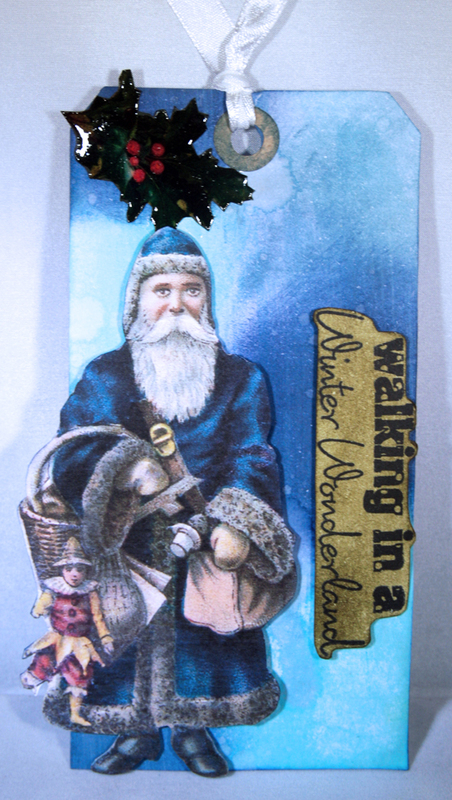 I covered the tag with picket fence stain and then stamped a few snowflakes in blue and embossed them with clear embossing powder. 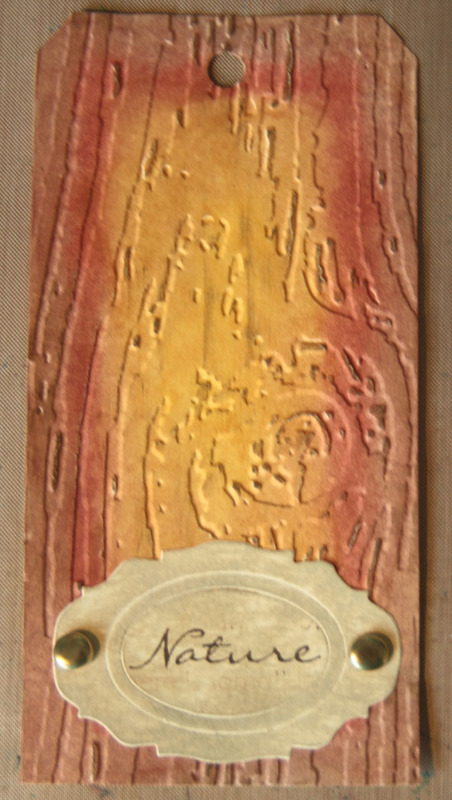 I stamped and embossed pine trees as well. I cut a chipboard house and covered it with sticky back canvas. Then I decorated with some words and charms. Share you tags with us on our Facebook page! !